Dickinson is a city in Stark County, North Dakota, United States. Appreciate the collections at Chateau de Mores and Ukrainian Cultural Institute. Deepen your sense of the past at sights like South Unit and Painted Canyon Overlook. 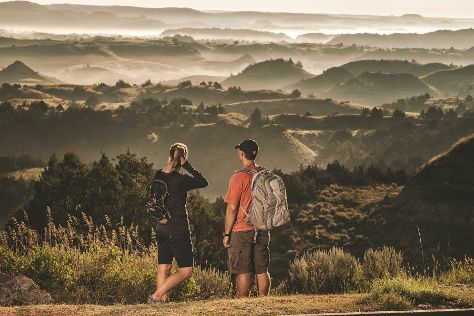 Explore Dickinson's surroundings by going to Enchanted Highway (in Regent), Assumption Abbey (in Richardton), Theodore Roosevelt National Park (Petrified Forest Loop, North Unit, & more) and Medora (Bully Pulpit Golf Course, Theodore Roosevelt National Park, & more). There's more to do: play a few rounds at Heart River Golf Course. To see more things to do, reviews, traveler tips, and more tourist information, refer to the Dickinson travel guide. Use the Route module to find suitable travel options from Johnson City to Dickinson. You'll gain 2 hours traveling from Johnson City to Dickinson due to the time zone difference. Expect a bit cooler temperatures when traveling from Johnson City in September; daily highs in Dickinson reach 73°F and lows reach 45°F. Cap off your sightseeing on the 13th (Tue) early enough to travel back home.